Wolfgang Amadeus Mozart, baptized Joannes Chrysostomus Wolfgangus Theophilus Mozart) (27 January 1756 – 5 December 1791) was a prolific and influential composer of the Classical era. His output of over 600 compositions includes works widely acknowledged as pinnacles of symphonic, concertante, chamber, piano, operatic, and choral music. Mozart is among the most enduringly popular of classical composers and many of his works are part of the standard concert repertoire. The youngest child and only surviving son of Leopold Mozart, Wolfgang Amadeus was born in Salzburg in 1756, the year of publication of his father's influential treatise on violin-playing. He showed early precocity both as a keyboard-player and violinist, and soon turned his hand to composition. His obvious gifts were developed under his father's tutelage, with those of his elder sister, and the family, through the indulgence of their then patron, the Archbishop of Salzburg, was able to travel abroad, specifically, between 1763 and 1766, to Paris and to London. A series of other journeys followed, with important operatic commissions in Italy between 1771 and 1773. The following period proved disappointing to both father and son, as the young Mozart grew to manhood, irked by the lack of opportunity and lack of appreciation of his gifts in Salzburg, where a new Archbishop proved less sympathetic. A visit to Munich, Mannheim and Paris in 1777 and 1778 brought no substantial offer of other employment and by early 1779 Mozart was reinstated in Salzburg, now as court organist. Early in 1781 he had a commissioned opera, Idomeneo, staged in Munich for the Elector of Bavaria and dissatisfaction after being summoned to attend his patron the Archbishop in Vienna led to his dismissal. Mozart spent the last ten years of his life in precarious independence in Vienna, his material situation not improved by a marriage imprudent for one in his circumstances. Initial success with German and then Italian opera and series of subscription concerts were followed by financial difficulties. In 1791 things seemed to have taken a turn for the better, in spite of the lack of interest of the successor to the Emperor Joseph II, who had died in 1790. In late November, however, Mozart became seriously ill and died in the small hours of 5th December. Mozart's compositions were catalogued in the 19th century by Köchel, and they are generally now distinguished by K. numbering from this catalogue. Mozart was essentially an operatic composer, although Salzburg offered him no real opportunity to exercise his talents in this direction. The greater stage works belong to the last decade of his life, starting with Idomeneo in Munich in January 1781. In Vienna, where he then settled, his first success came with the German opera or singspiel Die Entführung aus dem Serail (The Abduction from the Seraglio), a work on a Turkish theme, staged at the Burgtheater in 1782. Le nozze di Figaro (The Marriage of Figaro), an Italian comic opera with a libretto by Lorenzo da Ponte based on the controversial play by Beaumarchais, was staged at the same theatre in 1786 and Don Giovanni, with a libretto again by da Ponte, in Prague in 1787. Così fan tutte (All Women Behave Alike) was staged briefly in Vienna in 1790, its run curtailed by the death of the Emperor. La clemenza di Tito (The Clemency of Titus) was written for the coronation of the new Emperor in Prague in 1791, no such commission having been granted Mozart in Vienna. His last stage work, a Singspiel, was Die Zauberflöte (The Magic Flute), mounted at the end of September at the Theater auf der Wieden, a magic opera that was running with success at the time of the composer's death. As he lay dying Mozart was joined by his friends to sing through parts of a work that he left unfinished. This was his setting of the Requiem Mass, commissioned by an anonymous nobleman, who had intended to pass the work off as his own. The Requiem was later completed by Mozart's pupil Süssmayer, to whom it was eventually entrusted. Mozart composed other church music, primarily for use in Salzburg. Settings of the Mass include the Coronation Mass of 1779, one of a number of liturgical settings of this kind. In addition to settings of litanies and Vespers, Mozart wrote a number of shorter works for church use. These include the well known Exsultate, jubilate, written for the castrato Rauzzini in Milan in 1773 and the simple four-part setting of the Ave verum, written to oblige a priest in Baden in June 1791. Mozart's Church or Epistle Sonatas were written to bridge the liturgical gap between the singing of the Epistle and the singing of the Gospel at Mass. Composed in Salzburg during a period from 1772 until 1780, the sonatas are generally scored for two violins, bass instrument and organ, although three of them, intended for days of greater ceremony, involve a slightly larger ensemble. In addition to a smaller number of works for vocal ensemble, Mozart wrote concert arias and scenes, some of them for insertion into operas by others. Songs, with piano accompaniment, include a setting of Goethe's Das Veilchen (The Violet). Mozart wrote his first symphony in London in 1764-5 and his last in Vienna in August 1788. The last three symphonies, Nos. 39, 40 and 41, were all written during the summer of 1788, each of them with its own highly individual character. No. 39, in E flat major, using clarinets instead of the usual pair of oboes, has a timbre all its own, while No. 40 in G minor, with its ominous and dramatic opening, is now very familiar. The last symphony, nicknamed in later years the Jupiter symphony, has a fugal last movement, a contrapuntal development of what was becoming standard symphonic practice. All the symphonies, of course, repay listening. Of particular beauty is Symphony No. 29, scored for the then usual pairs of oboes and French horns and strings, written in 1774, the more grandiose Paris Symphony, No. 31, written in 1778 with a French audience in mind, the Haffner, the Linz and the Prague, Nos. 35, 36 and 38. The so-called Salzburg Symphonies, in three movements, on the Italian model, and scored only for strings, were probably intended for occasional use during one of Mozart's Italian journeys. They are more generally known in English as Divertimenti, K. 136, 137 and 138. The symphonies are not numbered absolutely in chronological order of composition, but Nos. 35 to 41 were written in Vienna in the 1780s and Nos. 14 to 30 in Salzburg in the 1770s. The best known Serenade of all is Eine kleine Nachtmusik (A Little Night-Music), a charming piece of which four of the five original movements survive. It is scored for solo strings and was written in the summer of 1787, the year of the opera Don Giovanni and of the death of the composer's father. The Serenata notturna, written in 1776 in Salzburg uses solo and orchestral strings and timpani, while the Divertimento K. 247, the Lodron Night-Music, dating from the same year, also served a social purpose during evening entertainments in Salzburg. Cassations, the word more or less synonymous with Divertimento or Serenade, again had occasional use, sometimes as a street serenade, as in the case of Mozart's three surviving works of this title, designed to mark end of year university celebrations. Generally music of this kind consisted of several short movements. Other examples of the form by Mozart include the so-called Posthorn Serenade, K. 320, which uses the posthorn itself during its course and the Haffner Serenade, designed to celebrate an event in the Haffner family in Salzburg. The Serenade K. 361, known as the Gran Partita, was written during the comnposer's first years of independence in Vienna and scored for a dozen wind instruments and a double bass. Mozart wrote some 30 keyboard concertos. The earliest of these are four arrangements of movements by various composer, made in 1767, in the form of keyboard concertos. 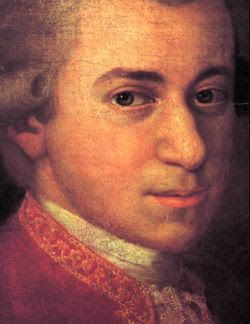 In 1772 Mozart arranged three sonatas by the youngest son of J.S. Bach, Johann Christian, to form keyboard concertos. These last three concertos are not generally included in the numbering of the concertos. Apart from these arrangements Mozart wrote six keyboard concertos during his years in Salzburg. The more important compositions in this form, designed clearly for the fortepiano, an instrument smaller than the modern pianoforte and with a more delicately incisive tone, were written in Vienna between 1782 and 1791, principally for the composer's use in subscription concerts with which he at first won success in the imperial capital. Of the 27 numbered concertos particular mention may be made of the Concertos in C minor and D minor, Nos. 24 and 20, K. 491 and 466. Mozart completed his last piano concerto No. 27, K. 595 in B flat major, in January 1791. Mozart wrote a series of five concertos for solo violin one in 1773 and four in 1775 in 1775 at a time when he was concertmaster of the court orchestra in Salzburg. Of these the last three, K. 216 in G major, K. 218 in D major and K. 219 in A major are the best known, together with the splendid Sinfonia concertante of 1779, for solo violin and solo viola. The Concertone for two solo violins, written in 1774, is less frequently heard. Mozart's concertos for solo wind instruments include a concerto for bassoon, two concertos for solo flute and a concerto for solo oboe, with a final concerto for clarinet written in October 1791. Mozart wrote four concertos for French horn, principally for the use of his friend, the horn-player Ignaz Leutgeb and a Sinfonia concertante for solo wind instruments, designed for performance by Mannheim friends in Paris. During his stay in France in 1778 he also wrote a fine concerto for flute and harp, intended for unappreciative aristocratic patrons there. It was inevitable that Mozart should also show his mastery in music for smaller groups of instruments. With some reluctance he accepted a commission in Mannheim for a series of quartets for flute and string trio, two of which he completed during his stay there in 1777/8. A third flute quartet was completed in Vienna in 1787, preceded by an oboe quartet in Munich in 1781, a quintet the following year for French horn, violin, two violas and cello and finally, in 1789, a clarinet quintet, the wind part for his friend Anton Stadler, a virtuoso performer on the newly developed clarinet and on the basset-clarinet, an instrument of extended range of his own invention. Mozart's work for string instruments includes a group of string quintets, written in Vienna in 1787 and, over the course of around twenty years, some 23 string quartets. Particularly interesting are the later quartets, a group of six dedicated to and influenced by Joseph Haydn and three final quartets, the so-called Prussian Quartets, intended for the cello-playing King of Prussia, Friedrich Wilhelm II. To the body of music of more serious intention may be added Ein musikalische Spass, K. 522 (A Musical Joke) for two horns and solo strings, written in 1787. The music is a re-creation of a work played for and presumably composed by village musicians, including formal solecisms and other deliberate mistakes of structure and harmony. There are other chamber music compositions, principally written during the last ten years of Mozart's life in Vienna, involving the use of the piano, an instrument on which Mozart excelled. These later compositions include six completed piano trios, two piano quartets, and a work that Mozart claimed to consider his best, a quintet for piano, oboe, clarinet, bassoon and French horn, K. 452. Mozart added considerably to the violin and piano sonata repertoire, writing his first sonatas for these instruments between the ages of six and eight and his last in 1788, making up a total of some thirty compositions. On the whole the later sonatas intended for professional players of a high order have more to offer than the sonatas written for pupils or amateurs, although there is fine music, for example, in the set of six sonatas written during the composer's journey to Mannheim and Paris in 1777 and 1778. Mozart's sonatas for the fortepiano cover a period from 1766 to 1791, with a significant number of mature sonatas written during the years in Vienna. The sonatas inculde much fine music, ranging from the slighter C major Sonata for beginners K. 545 to the superb B flat Sonata, K. 570. In addition to his sonatas he wrote a number of sets of variations, while his ephemeral improvisations in similar form are inevitably lost to us. The published works include operatic variations as well as a set of variations on the theme Ah, vous dirai-je, maman, known in English as Twinkle, twinkle, little star. There is very little organ music by Mozart or, indeed, by other great composers of the period, although organ improvisation was an art generally practised, then as now. Mozart's organ music includes a few compositions for mechanical organ, one improvisation, transcribed from memory by a priest who heard most of it, and a number of smaller compositions perhaps intended for organ, written in childhood. Mozart's last appointment in Salzburg was as court organist, and there are significant organ parts in some of the church sonatas he wrote during that brief period, in 1779 and 1780.